982 pages | 699 B/W Illus. 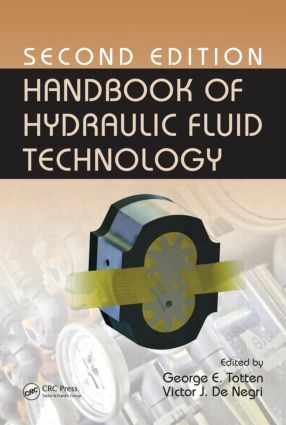 Detailing the major developments of the last decade, the Handbook of Hydraulic Fluid Technology, Second Edition updates the original and remains the most comprehensive and authoritative book on the subject. With all chapters either revised (in some cases, completely) or expanded to account for new developments, this book sets itself apart by approaching hydraulic fluids as a component of a system and focusing on key technological aspects. Written by experts from around the world, the handbook covers all major classes of hydraulic fluids in detail, delving into chemistry, design, fluid maintenance and selection, and other key concepts. It also offers a rigorous overview of hydraulic fluid technology and evaluates the ecological benefits of water and its use as an important alternative technology. This complete overview discusses pumps and motors, valves, and reservoir design, as well as fluid properties and associated topics. These include air entrainment, modulus, lubrication and wear assessment by bench and pump testing, biodegradability, and fire resistance. Contributors also present particularly important material on biodegradable fluids and the use of water as a hydraulic fluid. As the foremost resource on the design, selection, and testing of hydraulic systems and fluids used in engineering applications, this book contains new illustrations, data tables, and practical examples, all updated with essential information on the latest methods. To streamline presentation, relevant content from the first edition has been integrated into this new version, where appropriate. The result is a reference that helps readers develop an unparalleled understanding of the total hydraulic system, including essential hardware, fluid properties, and hydraulic lubricants. Polyalphaolefins and Other Synthetic Hydrocarbon Fluids, R.L. Shubkin, L.J. Gschwender, and C.E. Snyder, Jr.
George E. Totten, Ph.D., FASM received his BS and MS degrees from Fairleigh Dickinso University in New Jersey and his PhD. from New York University. Dr. Totten is past-president of th International Federation for Heat Treating and Surface Engineering (IFHTSE) and a fellow of ASM International, SAE International, IFHTSE and ASTM International. Dr. Totten is a Visiting Research Professor at Portland State University, Portland, OR and he is also president o G.E. Totten & Associates LLC, a research and consulting firm specializing in Thermal Processin and Industrial Lubrication problems. Dr. Totten is the author or coauthor (editor) of over 500 publications including patents technical papers, book chapters and books among which include: Handbook of Hydraulic Fluid Technology, Handbook of Aluminum Vol. 1 and Vol. 2, Handbook of Lubrication an TribologyVolume 1: Application and Maintenance, Handbook of Quenchants and Quenching Technology, Quenching Theory and Technology, 2nd Edition, Steel Heat Treatment Handbook, Handboo of Residual Stress and Deformation of Steel, Handbook of Metallurgical Process Design and the ASTM Fuels and Lubricants Handbook: Technology, Properties, Performance, and Testin (MNL 37) - among others. Victor Juliano De Negri, Dr. Eng, was born in Sao Leopoldo, Brazil. He received his Mechanical Engineering degree in 1983, from UNISINOS, Brazil, M. Eng. degree in 1987, and D. Eng. Degree in 1996, both from UFSC, Brazil. Since 1995, he has been Associate Professor at the Mechanical Engineering Department at the Federal University of Santa Catarina (UFSC). He is currently the head of the Laboratory of Hydraulic and Pneumatic Systems (LASHIP). He is member of ABCM -Brazilian Society of Mechanical Sciences and Engineering and LASHIP official company representative at the NFPA - National Fluid Power Association. His research areas include analysis and design of hydraulic and pneumatic systems and components and design methodologies for automation and control of equipment and processes. He has coordinated several research projects with industry and governmental agencies in the areas of hydraulic components, power generating plants, mobile hydraulics, pneumatic systems an positioning systems. He supervised 40 academic works including Master's and Doctorate Thesis and Final Term Projects. He has 2 patents and over than 90 journal and technical papers, conference papers, and magazine articles.